A slow cooker is a great way to cook meat at a low temperature in order to produce a tender piece of meat. It also allows you to add other flavors that will work their way into the roast as it cooks. Though many recipes call for adding water to the slow cooker, this is not necessary in order to get the tender, juicy results you want. It is possible to cook the roast without any liquid and still obtain tender meat. The slow cooker traps steam generated from cooking, which helps keep the roast moist. But liquids other than water can be used, such as broth, wine, beer or soup, to add flavor and moisture to the roast. Take the roast out of the refrigerator. Keep the roast covered and let it sit at room temperature for about 30 minutes. Preheat a large skillet with 1 tablespoon of olive oil over medium heat. Uncover the roast and dry it with paper towels. Season it with your desired herbs and spices, seasoning rub, or salt and pepper. Sear the roast in the skillet for 3 to 4 minutes per side. Arrange onion, carrot or celery slices on the bottom of a slow cooker. Make sure the bottom of the slow cooker is covered with vegetables, or add as many as you would like as long as the roast will fit. Drizzle the vegetables with olive oil and sprinkle them with salt, pepper and garlic powder to taste. Pour in 1/4 cup of beef or vegetable broth. This step is optional. Place the roast on top of the vegetables. Pour a 12-ounce can of cream of mushroom soup or another variety of cream soup over the roast, if you have not added beef or vegetable broth. This step is optional. Turn the slow cooker on high and cover it. Cook the roast for 1 1/2 hours. 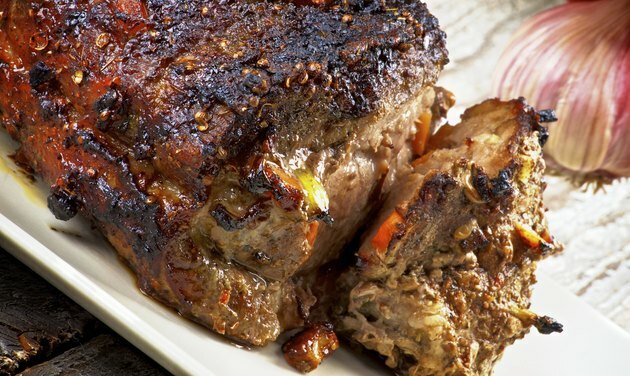 Turn the slow cooker to low and cook the roast for another 6 to 7 hours.